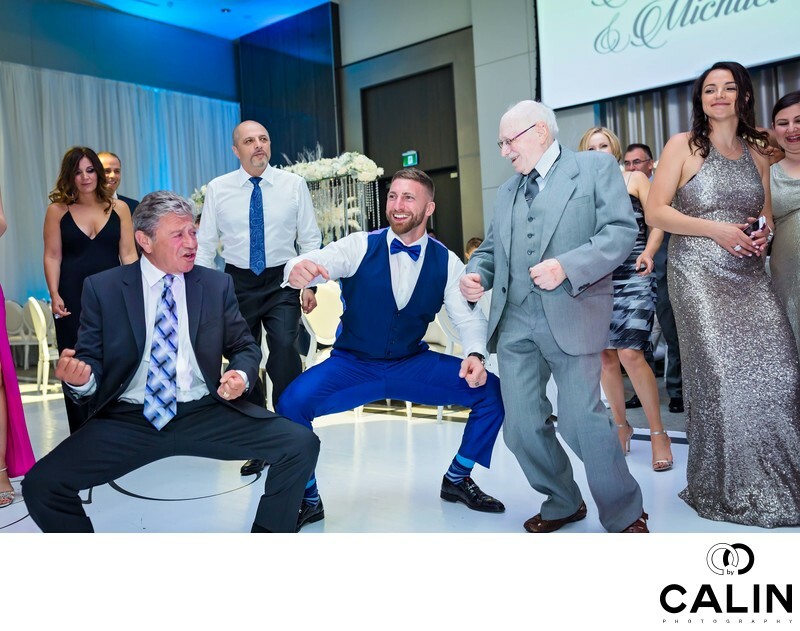 The wedding reception at Château Le Parc was one of my favourite parts of the big day because by then, all of the tension surrounding the big day had dissipated and everybody enjoyed themselves. In this beautiful photograph we see the groom flanked by two older men dancing full of energy. One of the people on the dance floor is the bride's grandfather was looking at the groom with immense love. The other gentleman is one of the groom's relatives. Around them we can see a few ladies looking at the three men dancing. This is a symbolical photograph in many respects. First, this image reunites the three generations on the dance floor. Second, it symbolizes the birth of the new family because the three men came from two families, but now are part of one. I attended plenty of professional meetings and during my discussions with my colleagues I often hear that there are wedding photographers who dislike taking pictures during the reception or worse, avoid taking family photographs. The reason is they do not consider those images worthy of the of their talent. The truth is, that especially when it comes to luxury wedding photography, the bride and groom do not want to those traumatic pictures we professional photographers strive to create. For those couples the most important thing is their families. Early, in my career, I realized that couples never included in their wedding album the pictures which I considered the most artistic. In fact, most of the images they picked were images capturing the love between the bride and groom and those featuring genuine moments. Back then, of the term documentary wedding photography was not that common but nowadays I know my clients wanted such coverage.